Join us as we discuss how to improve your health with fermented foods, which include sauerkraut, kombucha, kefir, kimchi and yogurt. In this episode, Aglaée interviews Sarah Ramsden and talk about what fermented foods are, how they can benefit your whole family and how to overcome your fear of making your own fermented foods. We also cover the safety of fermented foods for pregnant women, little ones and the whole family. Which fermented foods have you tasted? And have you ever tried fermenting foods at home? Let us know in the comments below or reach us on our facebook page. Sarah Ramsden is a Personal Coach and Nutritionist who believes that taking control of your health, is like a gateway drug for taking control of the rest of your life. 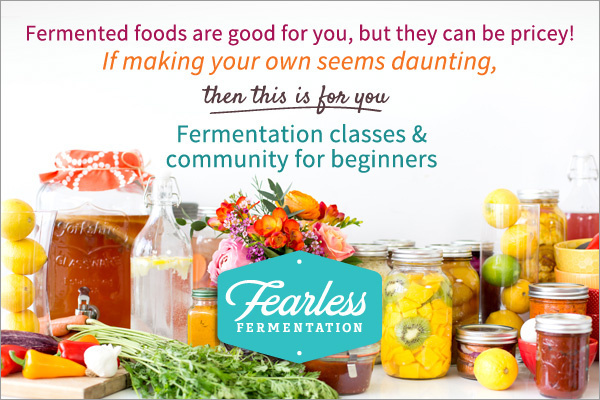 She is obsessed with fermented foods, and is the creator of “Fearless Fermentation”, where she provides online fermentation classes for beginners that dispel myths, and break through the worry of things going moldy. Her goal is to get fermented foods back on the dinner table as an everyday condiment. In her work as a personal coach, she works with women who’ve won the battle with major health issues, but are left feeling like an imposter in their own life: out of place, everywhere they used to feel at home. Coached by a brain tumour survivor who’s been EXACTLY where they are, Sarah helps her clients stop wondering if they’re making the most of their second chance, and turn it into the most exciting and meaningful time of their life. Sarah Ramsden talks about Fearless Fermentation! [8:02] Fermentation vs rotting vs probiotics: what is the difference? Aglaée's post on batch cooking for busy moms!